Get the compact printing power and wireless independence you need to print, scan, and copy from virtually any mobile device. The world's smallest all-in-one for home, this affordable printer is designed to fit - and look good - virtually anywhere. THE TINY ALL IN ONE THAT PACKS A PUNCH - this compact color printer features copy, scan, wireless print, AirPrint, and is Instant Ink ready so you'll never run out of ink. WIRELESS INDEPENDENCE - Mobile printing from your device such as iPhone with AirPrint, or print without a network using Wi-Fi Direct printing. 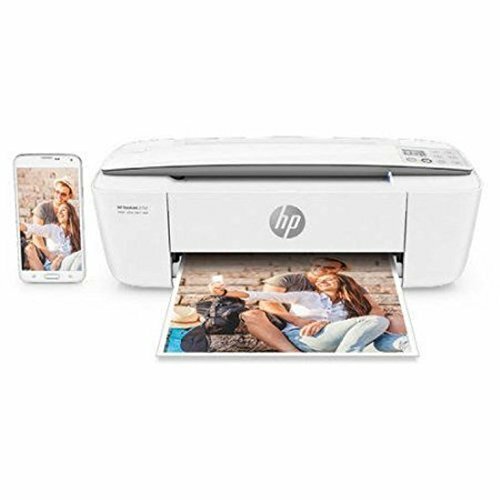 OUR MOST POWERFUL PRINTING APP EVER - Intuitive by design, the HP All-in-One Printer Remote app allows you to easily setup your printer, scan documents with your camera, and print from the cloud, such as iCloud, Google Drive, and Dropbox. THE WORLD'S SMALLEST ALL IN ONE PRINTER - This affordable printer is designed to fit-and look good-virtually anywhere. HP Scroll Scan helps you easily handle most scan jobs, without taking up the space of a full-size scanner. SAVE UP TO 50% WITH HP INSTANT INK - ordered by your printer and delivered to your door before you run out (optional subscription required).